The following article written by Dale Clifford appeared in today's Peterborough Examiner. Two of the bowlers, Matthew Ludlow (left) and Michael Brioux (right), are members of the Kawartha Komets Special Needs Hockey Program. CONGRATULATIONS, guys! For a special group of Special Olympians, it was an experience they will never forget. 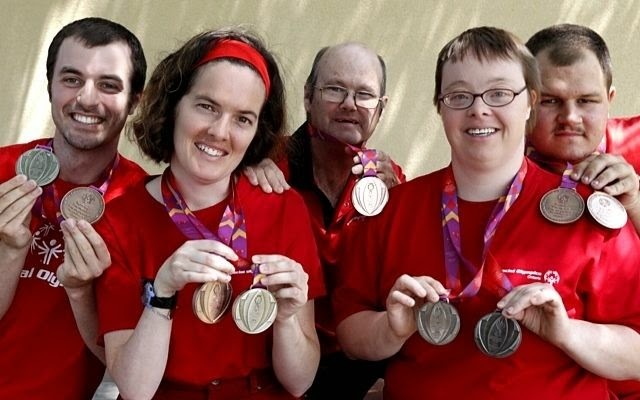 Not only did six members of Special Olympics Peterborough and area enjoy success on the podium at the Special Olympics National Summer Games in Vancouver earlier this month, they brought back memories that will last a lifetime. Representing one of four Team Ontario contingents, the team of five bowlers and one swimmer garnered 11 medals in total, including a bronze in team five-pin bowling. The bowling team comprised Michael Brioux, Katie Galloro, Matt Ludlow and Jeff Cassidy of Peterborough and Tim Keenan from Lindsay. Kelly Gellatly competed in swimming. It was considered the largest local representation ever in bowling. On the medal side of things, along with the team bronze, Ludlow, 25, and Galloro, 34, also captured individual silver medals while Brioux, 20, and Cassidy, 36, won single bronze on the lanes. Gellatly, 41, won two silver in the pool. The bowling team finished 17 pins out of first. It was the fourth national championship for Gellatly, who swims the 100-metre individual medley and 50m backstroke and breaststroke, third for Keenan, 47, and second for Galloro. It was Galloro’s first time bowling, joining other national first-timers, Cassidy, Brioux and Ludlow. While they spoke of their athletic success, they also talked about what it meant to be there, the people they met, where they were and other activities such as the opening and closing ceremonies. For many, it was their first time this far west and on a plane. For the championship, they stayed together in residence at the University of British Columbia. It was the first time for Gellatly competing in the western province. Local coaches, including people like Paul Brioux, Mary Harran and Bill Strode were impressed with their medal count as well as their personal experiences. Team Ontario bowling coach Kathy Pike of Barrie made the journey west. The Games hosted over 1,700 athletes, coaches and mission staff from across the country and Team Ontario comprised 353 athletes, 86 coaches and 17 mission staff from across the province.